Last month's meeting featured Dr. Trevor Royce, an outstanding facility oncology physician from UNC with a compelling discussion on bladder sparing treatment for muscle invasive disease. The question / answer session could have gone on all night. We also had a visit from Caitlin who is addressing Bladder Cancer awareness via social media. Lots of members had a bit of facetime in front of the camera. This month, we will be treated to a talk about the American Institute of Cancer Research (AICR) 2018 updated guidelines for cancer survivors from Jennifer Spring, RD, CSO, LDN. Jennifer Spring is a registered dietitian, licensed in North Carolina, and she is a Certified Specialist in Oncology nutrition. She has practiced as a clinical dietitian for over 14 years and has specialized as an oncology dietitian for the past 12 years. She currently practices with UNC Healthcare as a team member of the Comprehensive Cancer Support Program at the NC Cancer Hospital in Chapel Hill. It's going to be another fun and informative night.. Come on out! I'm still looking for volunteers as well as participants. summer, sharpen your chemo knowledge, learn to be a proactive patient, see what is new in non muscle invasive disease and more. 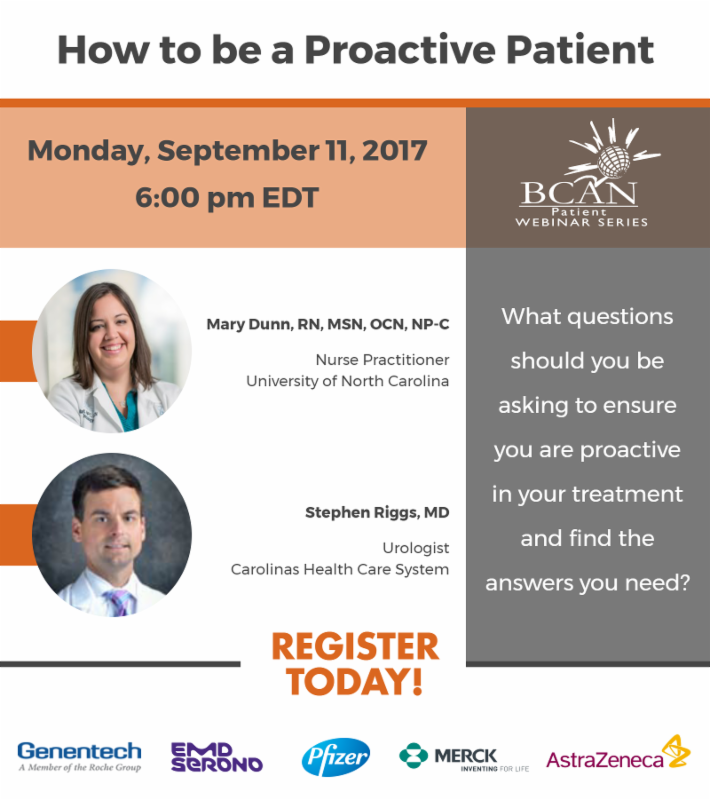 BCAN is proud to offer patient webinars, bringing nationally recognized bladder cancer experts directly to your computer. Learn about important topics related to bladder cancer diagnosis, treatment, research and quality of life. 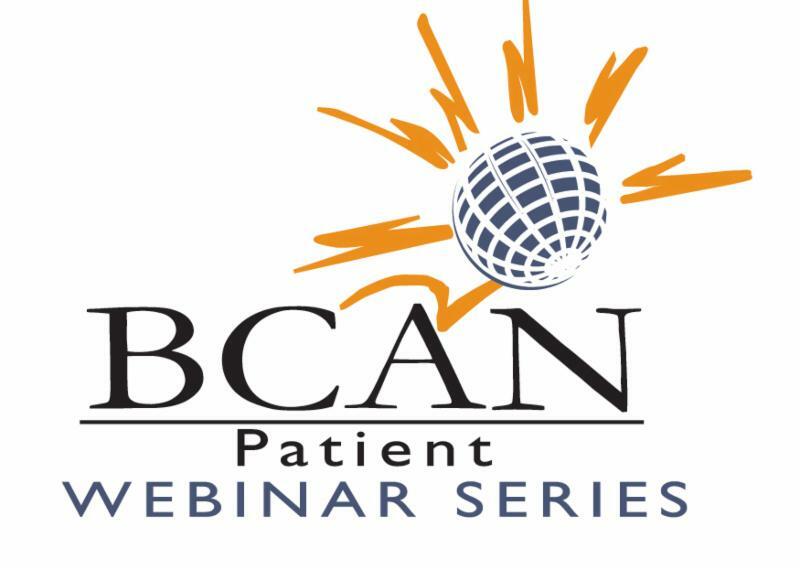 BCAN Patient Webinars, bring the experts to YOU! Nationally recognized experts in all aspects of bladder cancer diagnosis, treatment and survival join BCAN to help you learn more about your disease. Join us for an upcoming live program - ask your questions, get answers! Or watch an archived program and read the transcript! Systemic chemotherapy is used to treat bladder cancer that has metastasized. 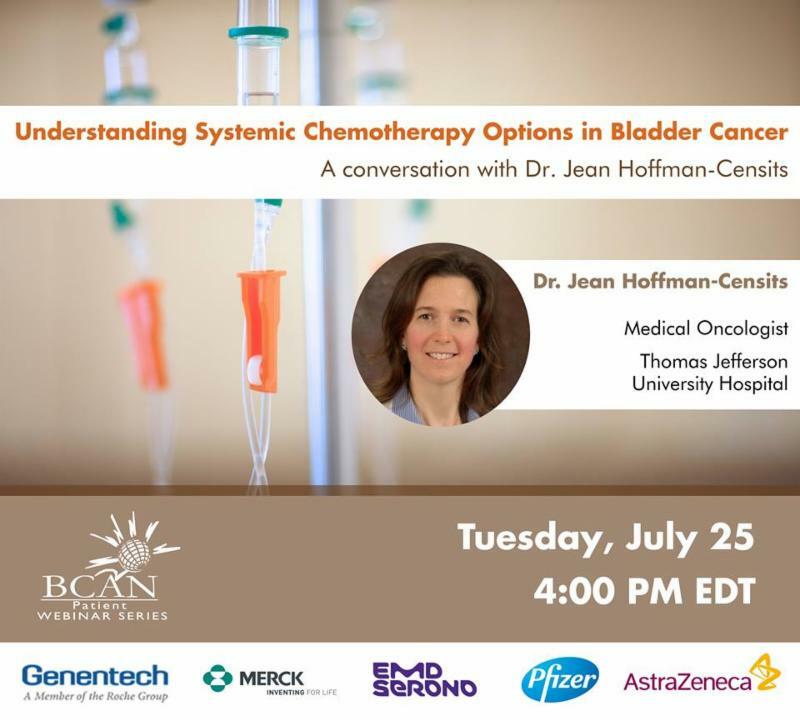 Medical oncologist Dr. Jean Hoffman Censits from Thomas Jefferson University Hospital will explain how this systemic therapy is used alone, and with surgery, or radiation, to treat bladder cancer. Urologist Dr. Stephen Riggs, and nurse practitioner Mary Dunn, RN, MSN, OCN, NP-C, help you understand the questions should you be asking to ensure you are proactive in your treatment and find the answers you need. 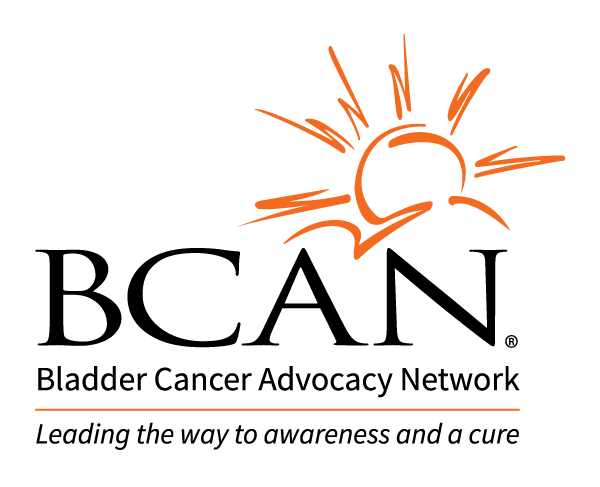 "Our mission is to provide support, education and outreach for those touched by bladder cancer: survivors, caregivers, friends and all that are affected."